Place the barbell at the correct height in the stand, then add the desired amount of weight. The correct height is the height whereby there is a slight bend in the knees when contact is made with the bar. Stand underneath the bar, align the bar on the trapeziuses, and grasp the bar at a comfortable width keeping the elbows back. Inhale deeply (as dictated by the blocking procedure explained below in "Further Clarification"), slightly arch the back (by rotating the pelvis forward) , tighten the abdominals, look forward (keeping the eyes fixed on an object to best maintain balance), and remove the barbell from the stand by standing. Carefully step back a couple of steps, ensure that the feet are positioned correctly (either aligned parallel to one another or pointing slightly outward), and that they are about shoulder with apart (which is preferred for standard squats). Squat downward by slowly sitting until the thighs are horizontal to the floor. Push with the legs until the initial upright position is once again assumed. Exhale. Foot placement is very important with squats and correct placement will vary individual to individual. The key is to maintain knee and feet alignment as much as possible. For some this will be achieved by pointing the feet directly forward and for others the feet may point outward. If your not sure which way is best for you, note the manner in which you walk. If your natural gait has your feet pointing outward, then that's probably the best position for you. It's inevitable that during the squatting motion the feet and knees won't maintain exactly alignment, but, as always, experiment to see which placement best suits your unique physical structure. There are two primary ways in which the barbell can be held. One way is to place the barbell on the trapezius alone. In this placement, the weight will reside higher up and slightly more forward that the alternative placement. The alternative placement is to place the barbell on both the trapezius and the rear shoulders. In this placement, the weight will reside lower and slightly more back than the former. This is the manner in which power lifters place the barbell when squatting because it allows for heavier weights to be lifted. Trap develop can help with improving the comfort of squats by providing a "meat" cushion for the barbell, thereby keeping it off of the vertebra, but this is not the sole factor for minimizing neck pain. Even those with large, thick traps may feel discomfort from the bar. So, anatomy has as much to do with bar comfort as any other factor. One option that may help is to pull the shoulders back, flexing the traps, which creates more muscle bulk for the bar to rest on. 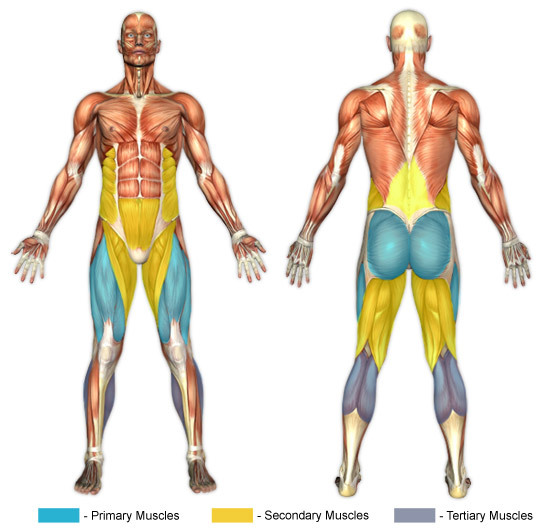 Generally, the trapezius and rear shoulder position results in a more comfortable lift because there is more surface area for the weight to be dispersed upon. Once consequence of holding the bar in this manner is that in the standing position, particularly, the barbell will have to be held in place with the arms to keep it from rolling or sliding of the traps and shoulders. Ultimately, even with pulling the shoulders back and placing the bar lower on both the traps and rear shoulders may not be enough to curb off pain or discomfort, especially when heavy weights are involved. This leaves option two, which can be used in conjunction with option one. Towels, pads, and other devices are sold that can aid in reducing discomfort. The most simple method involves wrapping a towel around the bar to add cushion between the neck and the bar. There are numerous pads on the market, designed just for the purpose of squatting, that go around bars and work in the same way as a towel, but are easier to use and (sometimes) provide more padding. Further, there is a device called a "Manta Ray". The Manta Ray is a piece of shaped plastic that goes around the bar and conforms to the trapezius, thereby displacing the weight across a much greater area. Differences in anatomy, such as long femurs or inflexible ankles, can cause difficulties in properly performing squats. In these cases, individuals have a tendency to tilt the torso forward too much, which is highly undesirable because it can lead to injuries (primarily of the knees and back). Luckily, there are methods that allow for easier, better performed squatting. Those with long femurs or inflexible ankles can simply place a block of some sort under their heels. The block can be specially made out of wood or it can be more rudimentary, such as a weight plate (or two). The width of the block depends on the individual's preference, but generally a one inch block will be sufficient. Experiment to find what works best for you. Do note, however, that placing the block under the heels causes more quadriceps isolation. The block helps by creating more natural balance (which helps prevent the torso from moving too far forward) and by preventing the knees from moving too far forward (out of alignment with the feet). Another helpful option for those with long femurs or inflexible ankles is to use the Smith machine. The Smith machine consists of a rigid frame with a track on it that only allows for strict vertical motion. This way, as long as the feet are placed in a proper location below it, knee and back injuries are much less likely to occur. Do not round the back! Use "blocking" to help avoid doing so.